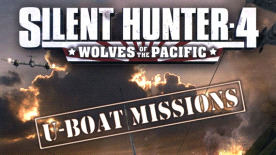 This product requires the base game Silent Hunter IV: Wolves of the Pacific. Experience the thrill of the hunt! Prowl the waters as the captain of a German submarine in a never-before-seen theatre of operations — the Indian Ocean. Take part in the war against British supply lines off the coast of North Africa and support the Japanese war against the U.S. Navy. Requires Silent Hunter IV (base game) to use this add on.